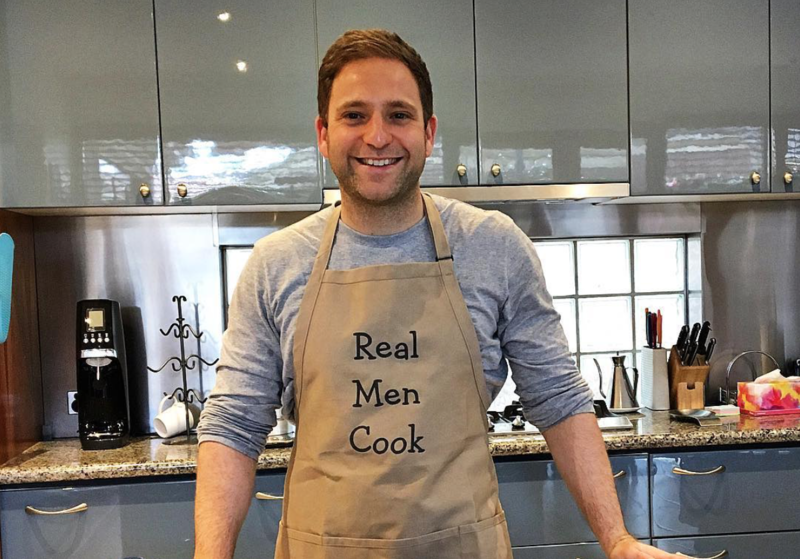 Joel is a dedicated and passionate Dietitian who has started a campaign to get more men in the kitchen! We had the chance to chat with him and hear his story. Q: What made you want to become an Accredited Practising Dietitian? A: I have always had an interest in food and nutrition and I love to cook, so it seemed like a perfect fit. Interestingly though, I first studied neuroscience and psychology; towards the end of my undergraduate degree, I intended to follow a career in exercise physiology. However, a chance half-hour meeting with a well-known dietitian swayed me toward pursuing dietetics. Since then I have loved every minute of my journey. On reflection, I’m surprised that it didn’t dawn on me earlier. Q: In your words, what is ‘Get your man in the kitchen’ (GYMITK)? A: The initiative is intended to encourage and inspire men to get into the kitchen and prepare healthy meals. They do not need to be experienced chefs, but just be willing to have a go at giving their meals a healthier spin. Manly meals such as baked potatoes, spaghetti bolognaise and steak, as well as chicken parmigiana can still be on the menu. The key is to tweak them so they are healthier than the original version. The campaign is centred on empowering men to cook more of the foods they enjoy. Studies show that those who prepare their own food typically consume fewer calories than when eating at a restaurant or ordering take-away. Q: How did GYMITK begin? What was your ‘ah ha’ moment? focusing on Men’s health. That was in February 2015. Later that afternoon, “Get our man in the kitchen” was born. I had no idea where it would go and if it would even take off, but I was determined to get my message out there. I took to Instagram and began to spread the good word using the GYMITK hashtag. Q: What is your vision for GYMITK? A: It’s pretty simple, really. It’s to encourage men to get into the kitchen and cook. I am a firm believer that all foods can form part of a healthy diet. And I also love the idea that any dish can be made healthier by tweaking particular ingredients and using healthier cooking methods. It’s a great way to manage your weight and reduce the risk factors for disease. Q: So, every business has challenges, what have been some of yours? A: The main challenge has been building my network of referring practitioners. As I predominately work in private practice, I’m mainly reliant on doctors and other allied health professionals to refer their patients. Another challenge to overcome has been dealing with self-styled nutrition gurus who have no training in nutrition, but believe they are experts in all things nutrition. It’s a real worry that non-evidence based science is being promoted so widely. Q: What have you learnt from these challenges? A: I’m slowly building my network of referring practitioners. It’s an ongoing process. It’s certainly not my favourite task, but it needs to be done. I guess it’s a bit like a job interview. Doctors and other allied health professionals want to know if you’ll be a good fit to meet with their patients. It can be quite an intimidating task to sell yourself in such a way. As for dealing with the pseudoscience and celebrity scientists, that’s a constant battle. I’ve grown a thicker skin and learnt not to engage with evangelical types who are hell-bent on pushing their own agenda. Q: Being face to face with clients is a big part of your chosen profession. How do you maintain client relationships? A: I email, call or text patients to keep track of their progress. I think it’s really important to maintain contact with patients between sessions. My patients really value this regular input. A: I have a driving passion to improve the health of all Aussies, in particular, the health of men. I practice a non-diet approach. I encourage people to focus on recognising hunger and fullness cues, to eat mindfully and to change their relationship with food and their bodies. Growing up, I had a poor relationship with food. However, over time I was able to heal that relationship. I love food and believe that it should be celebrated, not feared. However, there’s a lot of noise about food being ‘good’ or ‘bad’, ‘right’ or ‘wrong’. What drives me is a desire to help people trust their bodies and break down their barriers around food and diet. Given my own challenges growing up, I feel that I’m in a strong position to connect with people, and to impart helpful strategies to assist this process. It’s so rewarding to help people view their bodies and food in a different and more positive light and to have strategies in place that will ultimately lead to them making better dietary choices. Q: What would you tell a student who is about to graduate? A: Thought leader Simon Sinek talks about the Golden Circle, which has three fundamental principles – what, how and why. ‘What’ refers to what we do and ‘how’ is how we do it. These concepts are fairly straightforward, however, the ‘why’ is the most intricate layer. ‘Why’ is the core belief of your business/practice. We all know what we do and how we do it, but it’s the ‘why’ that is the most interesting concept to explore. Sinek challenges us to find our ‘why’. It taps into something that is deeper than simply our drive and passion. I would encourage all graduates to discover their ‘why’. Dietitians have a unique skillset. We tend to be good listeners, compassionate, intuitive and we are the experts in medical nutrition therapy. Discover your ‘why’ and you’ll be well on the way to carving out a successful career. Q: In terms of marketing, do you have a plan? How have you dealt with marketing over the years? A: I tend to fly by the seat of my pants. Sometimes I wish I’d had a more concrete marketing plan in place prior to starting my own business. However, with that said, I’m loving the journey. I like the idea that I have no specific plan moving forward. Perhaps I’m being naive, but I’m open to new experiences; maybe having a pre-determined plan would be limiting. Nevertheless, whilst not having a specific plan in place, I value what marketing can bring to a business and one’s profile. I’m learning each day how to market myself and how to get noticed for what I’m doing and aiming to achieve. I have also well and truly embraced social media. I was a bit old-school and didn’t see the value in having a social media presence. However, I’m so glad that I’ve finally jumped on board the social media train as it has led to some wonderful opportunities, and is a great way of promoting my positive Men’s Health messages. It’s also a great way to connect with other prominent people in my field. Q: What’s next for you and GYMITK? A: I have a few projects in the pipeline. I will be running men’s cooking classes over the summer in which I will demonstrate how to cook typically blokey meals, but with a healthier spin. Other than that, I am lining up promotional work with a food manufacturer. I would love to work in food industry one day, but I will only do so if I believe in the product and the values of the organisation. My goal for GYMITK is to continue to grow the campaign on social media, and to continue to spread my healthy eating message.